My 82-year-old father picked up one of the three books on my living room table and chuckled, “Timmy Failure!” I explained I had chosen to read this book series for middle readers for my Children’s Resources class at the University of Iowa. While the rest of us chatted, he continued to read, and to chuckle and guffaw, until I said, “Would you like to take that home with you, to finish reading?” And he did. He picked up the book and took it with him when he left, smiling and saying, “I have to finish reading Timmy Failure.” That was a huge score for the book, as far as I was concerned! Another plus: I wrote the author via Facebook about this little experience, thanking him for writing such a broadly appealing story, and HE REPLIED with thanks – what a guy! Stephan Pastis, creator of the award-winning, offbeat comic strip “Pearls Before Swine,” has written a terrific series for middle readers about a boy with plans – big plans – to launch a successful business and become wealthy so his mother won’t have to stress about bills ever again. Full of wackiness and bittersweet charm, Timmy Failure is wonderful romp through the adventures and mishaps of this kid who’s trying to make good in the world. There are great moments of poignancy throughout. As a reader, you laugh at the comic bumbles of the protagonist, a self-proclaimed CEO of his own one-man (not counting his polar bear sidekick) detective agency, while he himself carries on, undaunted. Timmy is an un-self-aware, unreliable narrator. In his mind, he is a busy professional, trying to move the success of his business forward, in spite of the encumbrances of having to attend school, having limited financial resources, and having friends who frustrate him. But, throughout the series, the author works in small “reveal” moments about Timmy, and about the characters who operate as his supporting cast. Flo uses no language beyond grunts, but he helps Timmy build his detective agency website. Timmy describes his appearance on his motorcycle in a later scene, at an event that is erupting in chaos: “My voice is drowned out by a sputtering roar. I look out the window. And see a familiar face. At least someone is dependable . . .” and we realize that Timmy has asked him to come – he has invited Flo the Librarian to the event – and Flo has shown up. Flo rescues an injured Timmy, as well as Timmy’s buddy, Rollo, “and scared the bejesus out of Rollo. Who, not being a regular user of the city library, had no idea who his rescuer was.” Flo is one of Timmy’s (many) champions! The books in the series have received recurrent positive reviews from Horn Book, School Library Journal, and Publisher’s Weekly. The series is, above all, warm and funny. Timmy himself is largely not to be charmed by the affection of his single mother, by the infatuation of classmate Molly Moskins, by the loyal friendship of his buddy, Rollo, by the educational finesse administered on his behalf by a new teacher, or by the gifts of Rice Krispie bars the playground attendant, Dondi Sweetwater, provides to him during his solitary recess times. But we, as readers, recognize the influence of these steadying presences in his life and the web of support that is woven around Timmy, “the weird kid,” by significant adults and friends. This kid is socially awkward, has delusions of grandeur, conjures an imaginary friend out of the polar bear at the zoo, and is hardly noticed by his “arch-nemesis,” Corrina Corrina (whose “nickname rhymes with Weevil Bun” – again, only in Timmy’s mind). Young readers can identify with this kid, and with the eccentricities of the characters in his orbit. We are clued into Timmy’s potential Attention Deficit issues by the astute descriptions of his struggles to study and excel in the traditional academic ways. In one chapter, Timmy journals about trying to focus on homework, but being distracted by the pattern in the wood grain of the table, then by a dog barking, “which makes me think of cars. Which rhymes with jars. Which hold mayonnaise. So now I’m eating a bologna sandwich. And two hours are gone. So I try to study again. But my underwear is too tight. So I have to change it . . .” and so forth. One teacher appears to recognize Timmy’s particular challenges, and collaborates with his mother to hook him in to his studies via another approach, one that plays into his strengths and interests. When he makes positive strides with his grades at the end of the first book, not recognizing the subtle framing-up of this objective, we want to cheer. Did I mention the humor? The sentences throughout the books are short, but some of the vocabulary is quite sophisticated. Timmy, remember, is a working professional, who “teleconferences” with his mother (at the dinner table), who’s business is “on the verge of becoming a Fortune 500 company,” and who feels like he has to dumb things down so his classmates (and unsuspecting adults) can understand his thinking, which pings around like a ricocheting bullet. Nearly every page has an illustration or two, which serve to drive home the humor and silliness of the stories. 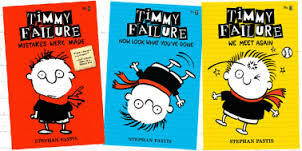 In the September 2014 School Library Journal, a reviewer writes that Timmy Failure is “highly recommended for kids who love Bill Watterson’s ‘Calvin and Hobbes,’ Jeff Kinney’s ‘Diary of a Wimpy Kid,’ Lincoln Pierce’s ‘Big Nate,’ and Rachel Renee Russell’s ‘Dork Diaries,'” declaring “this book and the entire series are a perfect go-to for reluctant readers.” I have to agree – Timmy Failure is truly, as it’s end-papers indicate, GREATNESS INSIDE.